PULSE ASIA SURVEY – The recent survey results released by Pulse Asia contains data showing Senatorial Candidates Grace Poe and Cynthia Villar on top of the list. The results of the latest survey for March 2019 were released on Thursday. Records show that Grace Poe still leads the race for senatorial positions with a 72.6 rating. Senator Grace Poe was the topnotcher during the 2013 senate polls and she was also ranked #1 Top Performing Senator in 2015. This were also based on data from Pulse Asia Surveys. 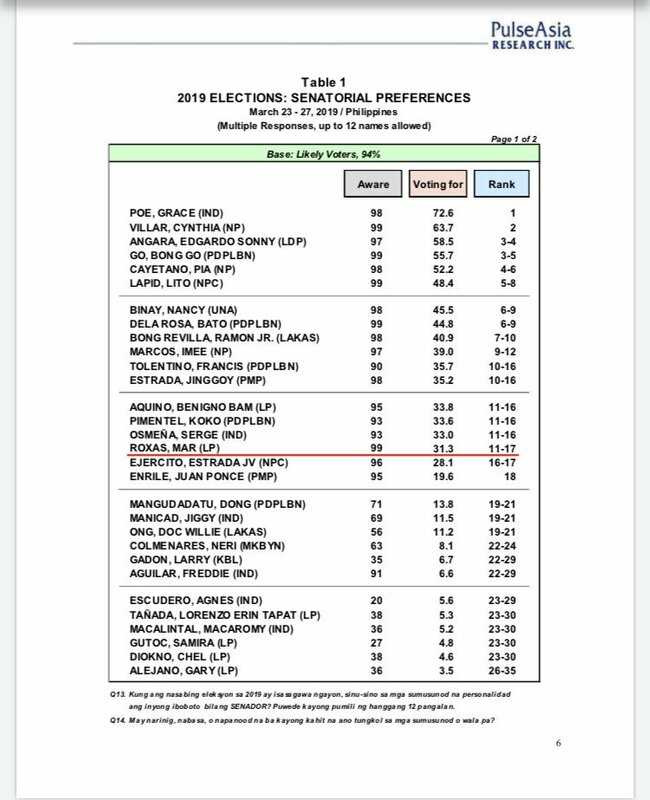 Meanwhile, Senator Cynthia Villar ranked second, next to Grace Poe, on the list with a 63.7 rating. Following them are Sonny Angara and Bong Go with scores of 58.5 and 52.2 respectively. Shown also on the Pulse Asia Survey results are the bottom two candidates that made it to the top 12. Senate bet Francis Tolentino and Jose Jinggoy Estrada both made it to the top 12 with respective scores of 35.7 and 35.2. Ilocos Norte Governor Imee Marcos with 39 percent. This is according to an article from GMA News. Eliminated from the top twelve are Senators Koko Pimentel and Manuel “Mar” Roxas with scores of 33.6 and 31.3. Joining the two outside the list of 12 are Senator Bam Aquino with 33.8 percent, and Serge Osmeña with 33 percent. That is all there is to it, at least for now, well post update as soon as we got them.